I was on my way to revisit East Bergholt's venerable Anglican parish church of St Mary, when this curiosity caught my eye. It is a former Methodist church, but of an unusual date, built in 1937. 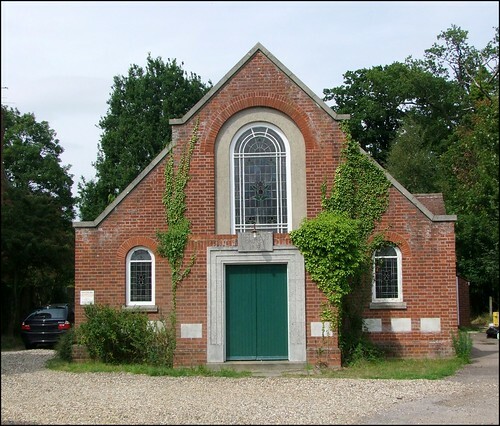 The East Bergholt Primitive Methodists had erected their first chapel in 1838, and managed 50 attendees on the afternoon of the 1851 census of religious worship, compared with 30 the Wesleyans attracted up the road in Brantham. In the 1930s, the different strands of Methodism came together, and the result was a surplus of buildings, with the need to rebuild on a large scale for the new communities formed. The replacement here is a handsome little structure, the Art Deco styling of the frontage giving an imposing effect and making it seem larger than it actually is. The huge arched window with its simple motif of stained glass is very effective. This chapel closed for business in 1982, and is now a private house.